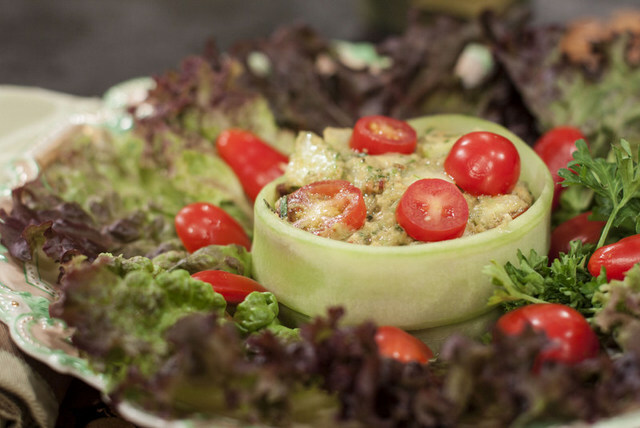 Special Note: This lovely salad makes a beautiful presentation for family or guests. It’s quick and easy to prepare, and full of vitality. If you want it creamier, use 1 avocado instead of the oil and zucchini. Can be used as a dip or spread on crackers or sandwiches. Using a special fluting peeler to peel the cucumbers. If you don’t have the tool, score down the outside with a fork for a fancier cut. Using a 1 cup measuring cup, scoop up some salad, turn upside down on a serving dish. Thinly slice down an English cucumber to make long strips the width of the cucumber. Use the slice like a ribbon and wrap around the salad. Secure with a smooth toothpick. Got grubs in your garden: – Place a few slices in a small pie tin to allow a chemical reaction create a smell to repel the little critters.